But did you know this is done by just one puppeteer (me)? How is this done? 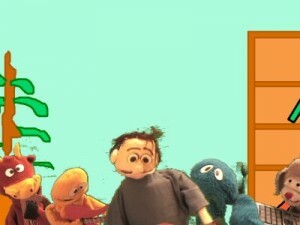 The short answer: Film all five puppets seperately in front of a green screen and composite them together. 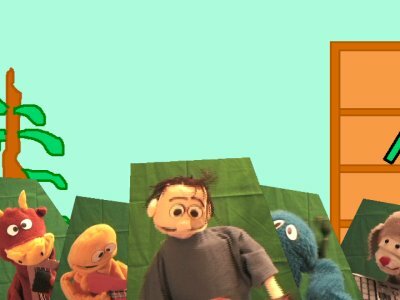 The long answer: It’s possible to just film all five puppets together in one take, instead having one puppeteer do it five different times. However, to do that, I would need five puppeteers, and also a really long green backdrop which I currently don’t have. That’s why I decided to do it this way. 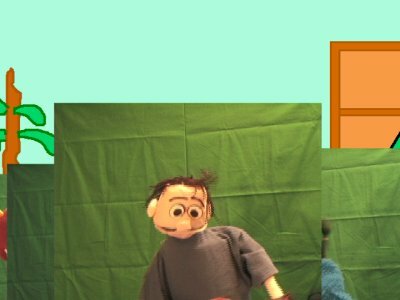 Theoretically, you can apply green screen effects an infinite number of times, because the green parts are going to become transparent in post-production, and you can layer them however many times you want. The green in the background is of irregular shapes, because I also used a garbage matte effect to cut out the unnecessary parts from the footage to make my green screen job easier. Without the garbage matte and green screen, this is what the original footage would look like after being shrunken to the sizes I want and layered on top of one another. Notice that you pretty much only see the character in the very top layer. Is it a lot of work? Yes. Do I like the end result? You betcha! What a great idea! It reminds me of how musicians (like Moby) lay down track after track until they have the whole thing…done by them alone. Oh yeah, that’s definitely one way of doing it. I have also read some musicians prefer to have everyone rehearse (if not record) their parts together because they think the music will come together more. They actually dislike that track by track approach. I guess it’s a matter of preference and has their own pros and cons. As for this, actually, if technical aspect isn’t an issue (like if I am part of a big TV production that provides me with all the appropriate lights and sets), I actually might prefer having all the characters perform at the same time. This way they can have better interactions with one another. I mean, it’s fun to see band members interact too, isn’t it? Different approaches definitely produce different flavors!